Jungle Red Writers: Survival at Sea? HANK PHILLIPPI RYAN: Things I have never done: a cruise. Oh, wait. I did a story about the QEII and sailed from Boston to New York, which was cool, but not really a voyage. But a real pack your bags, board the ship and (with flags fluttering and horns bellowing) take off for days on a floating hotel with a mizzendeck, lounge chairs and sixteen bars? Nope. But the intrepid Cate Holahan did it. With two little kids, no less. How bon do you think THAT voyage was? But she got a fabulous idea for a book from it. And, as we all know, that makes it all worth it. I brought the clear plastic bag to the tip of my nose and jostled its zip-sealed contents. A red box shook to the front from behind a Benadryl bottle. Bubblegum flavored histamine blockers wouldn’t beat an epinephrine-filled needle jammed, Pulp Fiction style, into the thigh. Still, a spoonful would be better than nothing in the event of an allergic reaction. I’d never given my little crew shrimp. I had no idea whether or not they were sensitive to shellfish. I had no idea how I would survive the next five days. 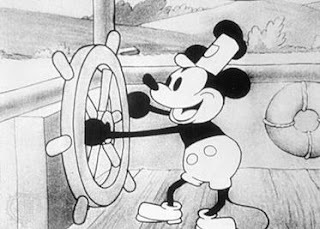 At the urging of a good friend, my husband had near-unilaterally decided that our two-year-old and a three-year-old should accompany his pal’s young family on a Disney Cruise. It was going to be GREAT!!!! Mickey. Tinker Bell. “Relaxing” by the pool and the ocean. ALL YOU CAN EAT! What could go wrong? The thriller writer in me wanted to inform him of Finagle’s law—or at least the fact that neither of our toddlers could swim. The wife in me saw his excitement and pressed her lips together. Yes, our kids hadn’t yet advanced from Yo Gabba Gabba to the Disney Princess stage. Sure, the stuff required to amuse and care for two children sub age-six would consume half of our 214-foot stateroom. Okay, so I’d be squeezing children accustomed to a sprawling suburban house into an area the size of the bedroom in my second Manhattan apartment. But, hey, it would be an experience! And, no, I didn’t want to offend our friends. “Do you think I have enough anti-nausea medication?” I asked. “Yes. The ship is a floating hotel. It’s so big that no one gets sick,” my husband responded. My husband looked at me like he should have packed a Xanax prescription. The cruise was not a vacation. My kids didn’t care about the Disney characters. They didn’t like being “penned in” on the ship. The drinks were too watered down. Worst of all, my two-year-old’s body chose that week to develop molars. My floating pharmacy did not include Orajel. Several times, as my two-year-old howled in our cramped quarters about the gums that I could not soothe and my husband drank with his dear friend by the pool, I stood on our stateroom balcony, belly pressed to the mahogany railing just beneath my bust, and mused about disappearing into the azure Caribbean sea. Would I make a splash? How long would it take to save me? Could I swim to Cozumel? I never jumped. But the passing thought did make its way into my next novel, TheWidower’s Wife. The protagonist in my book is trapped by a crisis, partially, of her own making. Writing about her circumstances brought back the cruise. I could feel the warm wind on my skin and see the ombré ocean through the balcony bars. I remembered feeling caged in a floating prison guarded by Mickey Mouse. Those very real feelings influenced my fiction and my dramatic choices. I wrote what I knew. In the end, I can’t say that the Disney Wonder was a wonderful vacation. But it was an inspirational one. HANK: Have you ever been on a cruise? Ever wanted to? Please report on your journey—or your thoughts on that journey! And a copy of The Widower’s Wife to one lucky sailor—er, commenter. 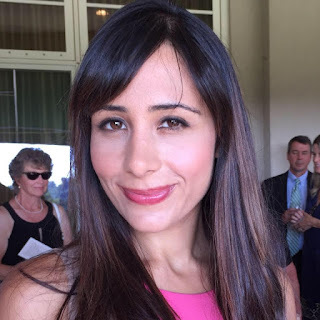 Catherine "Cate" Holahan is an award-winning journalist and former television producer. Her articles have appeared in BusinessWeek, The Boston Globe, The Record and on web sites for CBS, MSN Money, NorthJersey.com and CNBC, and other sites. 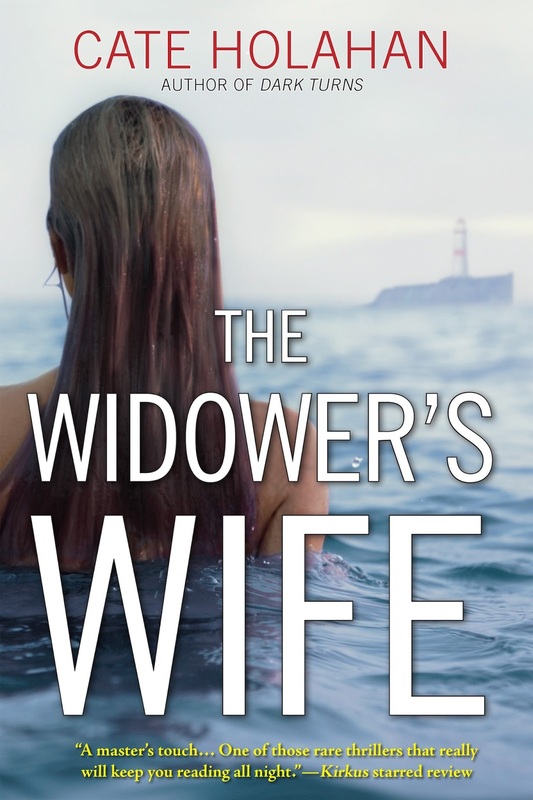 Her second thriller, The Widower’s Wife, was published by Crooked Lane Books on Aug. 9, 2016. Crooked Lane published her first book, Dark Turns, in November 2015. Cate, you poor dear. Your husband was lucky to live through that one. The only cruise I've been on was in the Galapagos, on a 20-berth ship for four nights. Upon which I was violently seasick within the first ten minutes while we were still in the harbor. Luckily, the Ecuadorian steward had a magic pill that gave me 12 hours' relief at a time, but I never could figure out what it was. The only US state I've not been to is Alaska. A great way to see some of the most spectacular parts of that state is on a cruise, but I don't think it's for me. Oh, Cate, I think that experience would be enough to cure me of any desire to go cruising. Although our friends keep saying that going on a cruise is a wonderful experience, we’ve never yet gone on one. For the moment, I think I’ll limit my seafaring to reading “The Widower’s Wife” . . . . The only "cruise" we have been on was on the MV Matanuska one of the large ferries of the Alaska Marine Highway. It had cabins and storage for our car and good food 3 times/day. It was clean and we could go on deck, sit in the enclosed front and talk to others or read, or both. They did have some nighttime activities, but we are early to bed people. We could see land all the time as we were on the inside passage, from Haines to Prince Rupert. We did see orcas, etc. After these three days and two nights we decided that cruising was not for us, although I would go on the ferry again given the chance. Cate, tell us more about the book! Oh boy, Cate, do I sympathize -- a cruise seems to me a form of earthly punishment. And with kids (and achey gums) in tow? Aaaagh. The only advantage is you don't have to keep packing and unpacking. Having said that we just signed up for an inland waterways cruise in Alaska. There's no other way to see it. But isn't that the great thing about being a writer? You can turn aggravation, grief, all manner of discomfort into riveting prose. Love the parallel ideas: trapped in a crisis, trapped on a cruise. What Lucy said, tell us more about the book! Not really a cruise but we decided to take an overnight hover ferry from Copenhagen to Dover. We had a very nice suite. Unfortunately there was enough room for all my in-laws to squeeze in, but they brought food and drink. So hey. Things went well till my sister-in-law found the TV and wouldn't shut it off. I removed the cord. She had her own tv travel cord and adapter set and turned it back on. I put it down the trash chute. The next night she stayed in a youth hostel. Cate, your book sounds great. Your cruise, not so much. We don't even do "tours", and a cruise is my idea of hell. I don't mind ferries to get from here to there, and I adore whale watching. Actually I quite enjoy boats of any size or shape. However, the thoughts of being penned up with a bunch of strangers for days, floating around on the ocean with a partner who gets sea sick in a hot tub, no no not for me. Maybe when I am very old and we aren't able to drive through Europe, I might consider it. Or just stay home and read a book. Yeah, I'll stay home. "Back in the old days," says she... Cate, we would have rubbed sore gums with whiskey, but that probably would have landed you in the brig these days. Although, great fodder for story. My father-in-law insisted we take a vacation years ago and even paid for it. He had waited to retire to travel and became ill by then and didn't want us to make the same mistake. We took a cruise through the Caribbean, which made us feel as if we were captive on a floating commercial. But we took a day excursion to St. John in the U.S Virgin Islands where we both fell hopelessly in love with the island. Thirty-plus years later, the love affair continues. We have spent countless weeks in St. John where I set my mystery series beginning with No Virgin Island and where we now spend winters. I often think of that cruise and the gift from my father-in-law and how it changed our lives. Brave, Brave, Brave woman. And I love your cover. As a denizen of small towns most of my life, I resolved early on never to go anywhere that would trap me with more people than inhabited my town. So far, I've succeeded. Well, almost succeeded. I have done live-aboard dive trips. Now that's a different story. Getting off the ship in the middle of the ocean is the whole point. Has anyone ever been on a Viking cruise? I spoke with someone the other day who has been on several, and she says they are fabulous! She told me a lot of fascinating stuff, too, like how you have to make sure the schedule is logical… Sometimes they go through the locks at night, which is good, but sometimes they go through during the day, which isn't. Or something like that. I am recuperating from cataract surgery… So off to rest. All good though! In fact, all fabulous. And yes, Cate, tell us a little bit more about the book! I love that we are sisters in television. Good luck on the recuperation. You will be so happy! I've never been on a cruise, but I sat next to someone, on a plane, whose late mother loved to go on cruises, and this woman thought she would go as a memorial to her mother. But no sooner did the ship set out that there was an outbreak of some disease and they couldn't dock anywhere and ran out of food. So I was not inspired. Friend of mine just got back from an Alaskan cruise. I'd love to do that. But not with kids. Or potentially The Hubby, who gets antsy when he can't up and go where he wants. But since all I'd want to do is sit, relax, and watch the scenery - do some reading and writing - I'd be good. In which case I'd also want to do a Caribbean cruise so I could sit outside in the sun. Reine, they have TVs on cruise ships? Yes, I agree Mary, a cruise with kids seems like recipe for disaster. Susan, I do worry about those outbreaks. Perfect breeding ground for Legionnaires and norovirus, just for instance, and it's order of magnitude worse than being sick in a hotel room. available in US and elsewhere. Note not for the faint of heart. I've been on quite a few cruises: through the Panama Canal, QM2 across the Atlantic, all over the Mediterranean, across the Pacific and a Christmas market river cruise. I've loved them all and never been sea-sick, even though on that Panama Canal cruise we had to escape from three THREE hurricanes. I enjoy them more than John does. He doesn't like being herded. I like only having to unpack once, getting dressed up for formal dinners and the magic of seeing an island appear on the horizon. (Oh, and the spa and the good food). I have to confess we choose cruise lines that are not family oriented. Kids running screaming over the decks while I'm sitting watching the ocean are not my idea of relaxation! The sight of a cruise ship in harbour makes me cringe. I know it has just unleashed about a million other tourists onto the shore, and I can't help feeling I'm going to be lost among them. (It's all about me, you see.) On the other hand, they represent a boon for the local economy. Frankly, just looking at those towering white floating cities, I don't even try to picture where on earth I would fit into that world. I wouldn't. But Cate, your books sound like just the ticket. FORMAL DINNERS?!? Me, running screaming. THough I've heard good things about those Viking River cruises. Somewaht smaller ships. Older folks onboard. And how choppy can a river get? I took an overnight ferry from Copenhagen to Scotland across the North Sea on one of its more violent nights. Sleeping quarters were a big rooms filled with bunk beds covered in carpet (no sheets or pillows). I went to try to eat and the ship pitched and I almost fell into the aspic appetizer/smorgasborg table, but fortunately, the person behind me lost their balance and grabbed me and pulled me away from the food (forever grateful). The ferry's disco - yes disco - was right across the hall from the sleeping quarters, and every time the ship lurched, dancers would come stumbling into the bunk room -- that was actually pretty hilarious. Hank, I hope you have a quick recovery from you cataract surgery! Cate, you are a most forgiving person. That your husband isn't still in the doghouse speaks well of your ability to let go of disasters. A child crying from hurting gums/teeth is at the top level of stress. It does seem that no matter how many medications we pack, it's always the one we don't that we need on a trip. I just don't think I'd like a cruise. I don't consider myself too claustrophobic, but being stuck on a ship in the middle of the ocean brings out loss of control issues with me. I really think I'd feel trapped and would constantly be looking for that next bit of land. Some of you have mentioned the Alaska cruises, and I do think I might be able to do that one, since it's for the scenery surrounding you. I wouldn't feel that lost at sea anxiety, or I don't think I would. I have taken the ferry from Ft. Meyers, FL to Key West, and it was fine, but, of course, I knew that within a short amount of time I would be on dry land again. Cate, I just put The Widower's Wife on my Amazon wish list. It certainly has gotten great reviews. Thanks everyone for the cruise support. I hope the Alaska cruise in fantastic. My mother just went on one with my father up north and they loved it. I think the key might be the company you keep. Teething children are never good travel companions. Hallie Ephron, speaking of the drinking on boats, that's how most people fall overboard on cruise ships. In fact, there's a site that keeps statistics on it and there was a spike after Titanic came out because of all the drunken people going to the edge of the boat and shouting "I'm King Of The World"... and then tumbling overboard. Hank, Thanks for asking for more about The Widower's Wife. I am pretty excited about the book. The story alternates between the viewpoints of Ryan Monahan, the insurance investigator looking into a young mother who has tumbled off a cruise ship, leaving her three-year-old daughter a multi-million dollar lie insurance policy, and the victim's viewpoint leading up to her fall. Ana Bacon, a first-generation American of since deported undocumented Brazilian immigrants, is the female protagonist. I wanted a character who, given her history, would be fiercely protective of the little family that she has left. And Kathy, it took awhile for me to get over the cruise. Let's just say I got to pick the next few vacations. I've been on two cruises. One was for our anniversary--we went to Bermuda. It seemed like such a good idea, but having a week and spending most of it sailing to and from and very little time actually at Bermuda was not a good choice. And the on board activities were limited, at best (gambling and eating). The second was a long weekend cruise with friends to the Bahamas. It was cold and rainy the whole time. The good thing was we got to spend time with our friends. The challenge was finding a place on the ship where we could hear ourselves. So, I can't say I'm motivated to try a third. We went with my inlaws twenty or more years ago to celebrate a significant wedding anniversary. It was my first cruise and it was wonderful. The others since have been so so. One was a family reunion cruise, mercifully only 3 days. Our son was in the army and couldn't come, but his wife and daughter could. I enjoyed seeing them. The Granddaughter was only about 2 and she would not tolerate being parked in the ship's version of daycare. Her mom had to fetch her often enough that she gave up on it. I am over cruises now. But a Viking-style river cruise could be appealing. No to cruise! Unless a cruise could happen other than on water and other than in a boat floating on that water. Just the thought is queasy making. Always needed Dramamine for the ferry trips from Seattle to Bremerton or to Vashon ... even on clear calm days. Those of you who can wishing you great voyages...as for me, taking the train across the country will be the closest I come to the self-contained hotel trip! Just a note on Alaska cruising -- it's been about 45 years -- but my memory of the ferry trip from Kodiak Island to Anchorage is a good one. Great food, good sleeping, enough Dramamine, and Wiemaraner to walk on the car deck! For those of you who mentioned wanting to see Alaska , but not cruise, there used to be railway tours that combined a little bit of being on a ship and a little bit of being on a train and some overnights in hotels. A great state to see and to savor. Elisabeth, I want to take the train cross country. I read this post by travel blogger Derek Low on his experience and it looked amazing (and affordable). I think river cruises may offer more opportunities to sight see and get a feel for a place, which is my favorite part of traveling. I want to imagine that I live where I am visiting--or at least spend plenty of time spying on the people who do. Susan, that poor woman. Trying to honor her mother and hit with a virus running through the ship. Hank, I hope you heal up quickly from your surgery. You'll probably have fighter pilot vision after you're all better. Hallie, it wasn't a cruise ship. It was a large hover-type ferry that went from Denmark to England or Sweden and other nearby countries. It had private rooms and dining, etc. There was a tv in our room, but I'm not sure if it wasn't playing recorded movies. We have relatives in Denmark who suggested it as a fun way back to England. We drove our car on board like you do if you're taking the big ferry out of Woods Hole. I don't like cruises, but I like boats and ships. The hover-craft-type are fast and comfortable. It was much nicer than any hotel rooms we would normally stay in. We usually go for cheap, but my mother-in-law was with us. I certainly would have found a more creative way to use cough medicine. Cruises seem ripe for homicide contemplation, as in whose effing idea was this?! Good job on Widower's Wife, still reading,don't want it to end, but I do, but I don't! Widower's wife sounds interesting and is on my TBR list. Hank speedy recovery congrats on taking the step to regain independence. My one and only cruise was an award cruise given to my division. In the middle of the night my daughter and I were awakened with the klaxton and the announcement "We have a fire in the incinerator" I sleepily thought, "isn't that where it is supposed to be? The ship was on fire. After about 90 mins. the all clear notice was given. All was well, and as Hallie says any situation can become a good 'story'. We went on a river cruise today in New Orleans but that probably doesn't count. In 2012 we went on an Alaskan cruise Hallie, you'll love it) and had a great time. It was a "small" ship - 1300 passengers/650 crew so basically you had your own crew person. We walked on a glacier! Coolest thing I ever did....Although when I got home it took awhile to get used to not having somebody make my bed and leave chocolate on the pillow every night. Or leave us towel animals. Cate! A fighter pilot! I love it! I can almost see perfectly and it is SO exciting! Thank you so much for all your good wishes.. It was really scary, I must say. But so lovely to see you all chatting and happy --love you all ! Love you so much Hank! Bless your quick recovery. All my friends who had the surgery wish they had it years ago. Cate, you are great! What more can I say than that. Thanks Reine! And I am so happy that the surgery worked well for you, Hank. Coralee, my post gave short shrift to the towel animals. I have to say some of those towel animals were really impressive on the Disney Cruise. There were swans, monkeys, disney characters. Whoever made up my room had serious towel sculpting prowess. Once took a ferry from England to Bergen or Oslo in Norway. We sat in big recliner seats with our backpacks. Very cheap too. Too scared to take an ocean cruise. May take River cruise. If the boat sinks, at least we can swim to shore. I forgot about the towels. See... the more someone else handles them, the less I want to use them. I don't care how cute they are.